Powers: She herself possesses no superhuman abilities. Her power resides within the Witchblade and is limited only by her imagination. 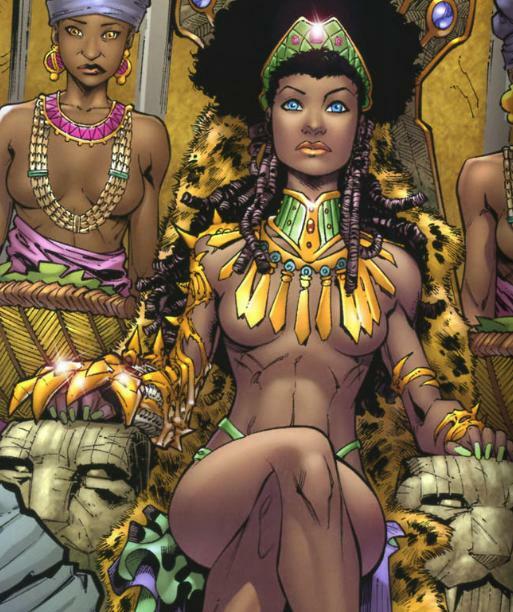 Though not a member of the Songhai Empire, Queen Kijani ruled over the lost city of Tombuto, sometimes referred to as Timbuktu. She was the real power behind Askia Mohammed I. He controlled the land’s riches, but she controlled the power. The queen protected her kingdom without the need of an army, so feared was the power she possessed in the form of a gauntlet on her right arm, though Tombuto’s military was rumored to have 3’000 horsemen surrounding Askia at all times. Leo Africanus, the adventure and scholar was known to have studied under her tutelage.